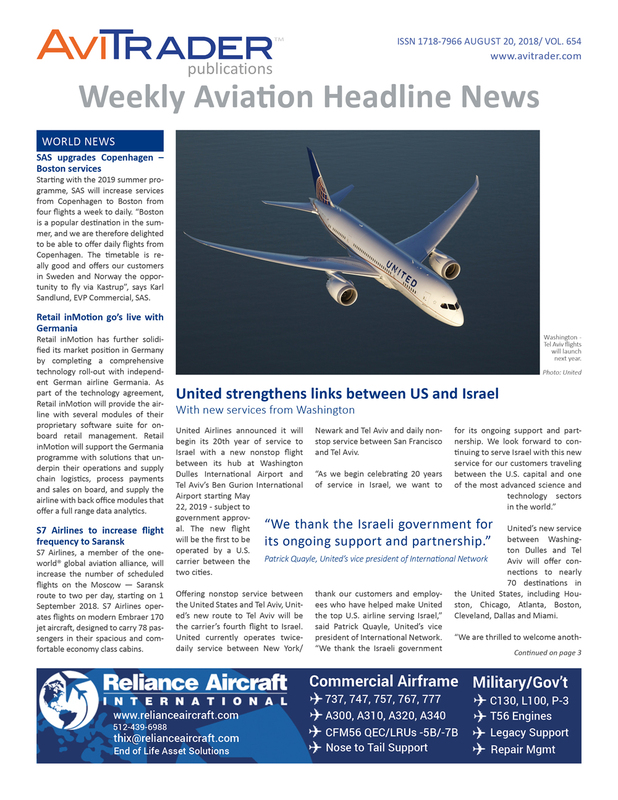 Anticipated joint ventures with three Latin American airlines – Colombia’s Avianca Holdings, Panama’s Copa Airlines and Brazil’s Azul Linhas Aéreas Brasileiras – and the parent company of United Airlines (United), United Continental Holdings, are proving to be more complicated than initially envisaged. While the intention is to improve connectivity between the U.S. and Latin America, increased competition in Mexico which is putting certain carriers under pressure, and Brazil’s unexpected economic recession, has complicated matters. Kirby also told reporters on the sidelines of the International Aviation Forecast Summit in Denver that United is looking to add lie-flat beds in business class in 2020 on some of its Boeing 737 MAX 10 narrow-bodies that would fly domestic routes. United is the world's third-largest airline when measured by revenue, after American Airlines and Delta Air Lines. The U.S. carrier operates a large domestic and international route network, with an comprehensive presence in the Asia-Pacific region. United is a founding member of the Star Alliance and operates a regional service through independent carriers, under the brand name United Express. Air China has ordered 2500 CL3710 economy class seats from Recaro Aircraft Seating for their ten new Airbus A350 aircraft. China's flag carrier is the first operator of the A350 in Mainland China. The CL3710, Recaro’s bestseller with over 250,000 orders worldwide, brings together all the German aircraft seat manufacturer’s expertise and skill. The CL3710 offers Air China long-haul seating comfort for passengers in the economy class. The six-way adjustable headrest, the newly developed footrest and articulated seat pan make the seat one of the best in its class. Weighing less than 12 kilograms, it ensures exceptionally efficient and economical flying. ERA (European Regions Airline Association) has welcomed Air Alsie as its newest airline member, bringing the number of carriers in ERA membership to 51. 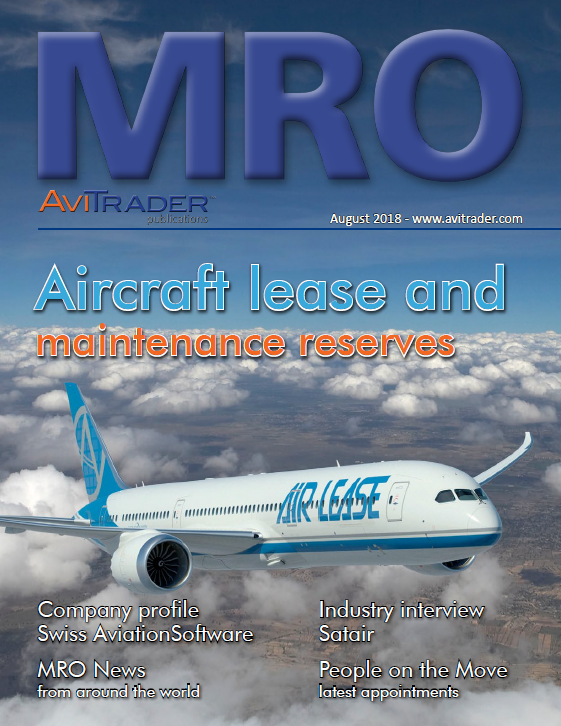 Based in Sønderborg, Denmark, Air Alsie has been operating since 1989 and with an available fleet of 22 aircraft, is the largest executive operator in northern Europe. Air Alsie, owned by Sandma Holding A/S, has grown steadily over the years. Air Alsie has 180 employees and provides aircraft management, charter, ACMI and executive jet services. Lockheed Martin's board of directors has approved the appointment of Michele Evans, as executive vice president of the Aeronautics business area, succeeding Orlando Carvalho, who intends to retire later this year. Evans' appointment is effective Oct. 1, 2018. Evans has more than 30 years of experience and currently serves as deputy executive vice president for the Aeronautics business area. She is responsible for all Aeronautics programs, including F-35, F-22, F-16, C-130 and Advanced Development Programs. Fraport USA, a wholly-owned U.S. subsidiary of Fraport AG and a leading developer of award-winning airport retail programs, has been selected by the Metropolitan Nashville Airport Authority to manage and develop the concessions program for Nashville International Airport (BNA). Over the term of the contract, Fraport will enhance the shopping and dining experience for more than 14 million passengers in one of the fastest growing airports in North America and in a top tourist destination. Expected to begin in February 2019, the 10-year agreement covers the design, construction, lease and management of more than 6,400 m² of concessions space in the airport’s four concourses. The reimagined program will offer an exciting mix of the best local to global brands and celebrate Nashville’s rich cultural heritage and thriving music and arts scene. Hawaiian Airlines has announced its decision to suspend its thrice-weekly nonstop service between Honolulu’s Daniel K. Inouye International Airport (HNL) and Beijing Capital International Airport (PEK) upon the completion of the National Day Golden Week holiday in October. The airline, which started the service in April 2014, will re-deploy its 278-seat Airbus A330-200 aircraft elsewhere in its network. “These decisions are never easy and this one is especially difficult because we believe in China’s future as a robust market for the Hawaiian vacation experience and we will continue to market one-stop options to Honolulu from cities throughout China on our airline partners,’’ said Peter Ingram, Hawaiian’s president and CEO. Ryanair and Air Malta have jointly announced that the Irish carrier will cooperate on sales and marketing initiatives by selling Air Malta flights from its website ryanair.com as from August 21. This win-win milestone agreement for both parties will offer Ryanair’s 139 million customers an even greater choice of destinations whilst also boosting Air Malta’s ticket sales through this new distribution channel in overseas markets where Ryanair traditionally is stronger. This partnership is the latest initiative delivered under Ryanair’s “Always Getting Better” customer experience program and falls in line with Air Malta’s successful growth strategy and vision to be the airline of the Mediterranean. Customers at Dallas Fort Worth (DFW) International Airport will fly nonstop to Dublin, Ireland and Munich, Germany, starting June 6, 2019, thanks to new service from American Airlines. With these flights, DFW Airport will provide its first ever nonstop service to Ireland and its third daily nonstop flight to Germany. The launch of Dublin and Munich service in June 2019 will give DFW a total of 59 international destinations and 235 unique destinations. The new destinations will be DFW's eighth and ninth European cities served. Since 2010, DFW Airport has added a total of 21 new international destinations. Aircastle has announced the promotion and appointment of Jim Connelly as Chief Accounting Officer. Connelly has been Aircastle's controller since January 2013. He joined Aircastle in May 2007 as Assistant Controller, Operational Accounting. Prior to joining Aircastle, he was with Lehman Brothers as Controller beginning in January 2001. He received a B.S. in Accounting from Syracuse University. Jet Aviation has received EASA Supplemental Type Certification (STC) for ADS-B Out compliance for the B747 series aircraft, some 2 years ahead of EASA and FAA 2020 mandates. With this approval, Jet Aviation’s MRO and Completions facility in Basel is authorized to configure and install ADS-B Out systems on B747 aircraft subject to specific equipment configurations. ADS-B Out compliance delivers digital information such as the aircraft’s exact position, sensors and system accuracy and traffic and resolution advice to airborne and landed Automatic Dependent Surveillance-B (ADS-B) receivers. This enhances situational awareness for Air Traffic Control of aircraft with ADS-B Out capabilities and is mandated by the FAA effective January 2020, followed by EASA in June 2020.